This severe earthquake generated over 200 landslides and several small-scale tsunami on the South Island's west coast. 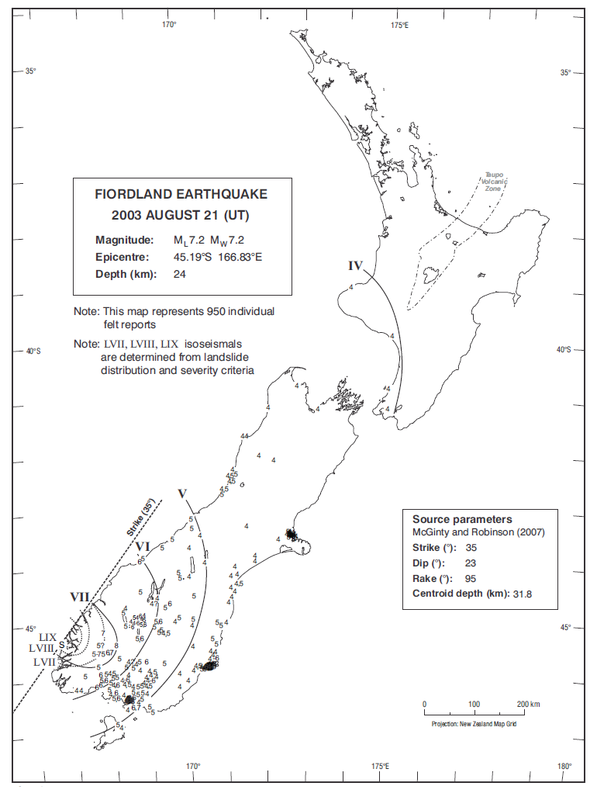 Isoseismal map of the Fiordland earthquake. Courtesy Atlas of isoseismal maps of New Zealand earthquakes (2nd edition): Downes, G.L. ; Dowrick, D.J. The earthquake that struck Fiordland, in the south-west corner of the South Island, on 22 August 2003 was the largest to hit New Zealand in many years. Fortunately the earthquake’s epicentre was not near any heavily populated areas, so personal injuries and damage to property were quite minor. It was felt from Auckland to Stewart Island, and even as far away as Sydney, Australia, but it was experienced most strongly in the small South Island town of Te Anau. Here, buildings shook, and objects and small appliances were thrown from shelves. Closer to the epicentre, in the steep slopes of Fiordland, over 200 landslides were triggered, some of which generated small local tsunami when they hit the water. Further offshore the earthquake raised the seafloor significantly, causing another small-scale tsunami that was recorded up the coast at Jackson Bay, and also at Port Kembla in Australia, 1,650 km away.